U.S. Seafood & Meat Co. is dedicated to providing our customers with excellent customer service and the freshest Chesapeake Blue Crab and seafood on the web! We offer tools to allow you to view past orders, update your account information, expedite checkout processes, reset your password and more. Please see below for detailed information on each section. Call (800) 385-3909 to speak directly with a Customer Care Specialist regarding any questions or concerns you may have. Our winter hours are 11 am to 5 pm Eastern Standard Time (EST). These hours are in place January 1st till April 1st. Currently, products ordered through our website may be shipped to the entire United States of America. The loss coverage option is available at checkout. If you select the loss coverage option at checkout, we, in turn, add the UPS capital loss coverage to your order on your behalf. All claims involving the loss coverage follow the policies and procedures stated in the UPS capital loss agreement. Please note we are not the ones providing the loss coverage. We are merely making the loss coverage available to you as the customer. If you decline the loss coverage we are not liable to refund or replace any order. Selecting products and placing an order at U.S. Seafood & Meat Co. is quick, easy; and above all, completely secure. Follow these helpful steps to completing your online order. If you are merely making a shopping list, you will follow all steps except "Completing Your Online Purchase." Once you have found the item you would like to purchase, simply enter in the quantity and click the "Add to Cart" button. This button is located at the bottom of the "Product Detail Page," next to the bottom of the product image. If you do not enter a number in the Quantity box, it defaults to "1". When you have finished adding items to your Shopping Cart, click the Checkout link (located on the right-hand panel on every page of our site). This selection begins your checkout process. If you wish to buy multiple quantities of an item you have placed in your Shopping Cart, change the number in the "Quantity" box. Please click the "Update" button again for each change you make in the quantity. The quantity does not add the new number to your current total, but instead replaces it. You can view your Shopping Cart at any time during the shopping process by clicking on the View Cart link on the right-hand panel. If you prefer to wait until another day to buy the items in your Shopping Cart, U.S. Seafood & Meat Co. saves those items (using a cookie) and keeps them active for three (3) days. You may continue to add items to your Shopping Cart if you return to the site within three (3) days. Delete unwanted items from your shopping cart by clicking on the "X" button located on the right side of the item in your shopping cart. Secure Online Ordering is enabled by clicking the "Checkout" button. This link will take you into a secured area where U.S. Seafood & Meat Co. will guide you step-by-step through the ordering process to complete your online transaction. If you need to revise your profile, change your password, view order history, create a shopping list, or set up express checkout, sign in to your account. Not a registered user? Take a moment to register with U.S. 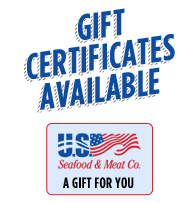 Seafood & Meat Co. and enjoy faster online checkouts, sign up for e-mail newsletters, save shopping and projects lists, create a gift registry and more. Wondering about the status of an order? Want to change your billing or shipping information? Care to view previous orders placed on our website? All these can be done by yourself via My Account. Sign Up now and enjoy a more convenient method of shopping. To change the name, billing and/or shipping address associated with your account, sign in to My Account using the e-mail address and password currently associated with your account, and click the Update Billing Information link under Account Settings menu. To view your Order History, sign in to My Account using the e-mail address and password currently associated with your account. If you have already signed up for a Customer Account, please login in here to check the current status of your order. If you are not currently signed up for a Customer Account, please Sign Up Now! . This will expedite future ordering processes and all future orders will be accessible through your account. All order cancelations must be made 24 hours before order ship date. Ordering Online with us is safe and secure! All our orders are backed by with a $10,000 coverage against fraud and misuse as a result of directly ordering from the USASeafoodCo.com website. U.S. Seafood & Meat Co. employs a method of interaction with our visitors that does not compromise credit card information. This online system is 100% secure. Due to the nature of our business and the products, we offer, items purchased through the USASeafoodCo.com website cannot be returned. U.S. Seafood & Meat Co. strives to ship the absolute freshest seafood available anywhere. Every item we sell is carefully inspected before it is packaged and shipped. When your order leaves our facility, it is packed with more than enough refrigerant to prevent spoilage for five (5) days in transit. If our seafood arrives damaged, please contact us immediately. All concerns must be received within 48 hours of delivery. Since U.S. Seafood & Meat Co. offers nearly all perishable products, shipping ALL our seafood in the freshest condition takes thought and careful planning. We've come up with our own fresh gel pack system that keeps perishables cool in transit for up to 48 hours. We take care to arrange your seafood in specialized boxes designed to keep your order in the freshest possible condition upon arrival. We are dedicated to providing you with the freshest hard shell crabs and seafood on the web; therefore, if you have any questions about our Return and Refund Policy, please feel free to call us at (800) 385-3909. U.S Seafood and Meat reserves the right to make all final decisions on the validity of concerns regarding orders. Gift cards are herein deemed an acceptable method of compensation for customer concerns. 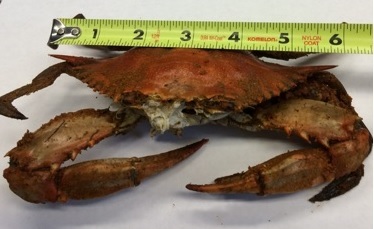 If the size or quality of your Blue Crab order should come into question, please take photos of the crabs next to a ruler or tape measure point to point and email them to customerservice@usaseafoodco.com. We will not review any cases without photo documentation. You may make an address correction within twenty-four hours of your order submittal. Address corrections can be made by phone or email. All corrections must be made 24 hours in advance of the package shipping out. Any corrections emailed or given within the 24 hour window can not be guaranteed they will be made. Any address correction made on the same day the package is shipped may cause a minimum of a one (1) day delay. If you place your order within the 24 hour window. "Please sail slowly to ensure that you are entering the correct delivery address." Each Blue Crab Is Measured From Point to Point. What do I do if I forgot my password and can not log onto the site? If you forget your password, click on the "Forgot Password" link. Once you type in your email address at the prompt, a new login key will be sent to you. Click the link in the e-mail to sign in, and then change your password. If you still cannot log onto the site, let us know by emailing us at customerservice@usaseafoodco.com and we will reset your password for you. If you have any questions regarding tracking, please email us with your order number at customerservice@usaseafoodco.com or call us Toll-free at (800) 385-3909. Hours: Monday through Saturday 10:00 A.M. to 5:00 P.M. Eastern Standard Time (EST). By Phone: Call us Toll-free at (800) 385-3909 if you are calling from the United States of America. If you have an issue, we want to make it right! Please email us at customerservice@usaseafoodco.com with a description of your specific question or issue. We work to answer our emails within 24 hours or feel free to call us Toll-free at (800) 385-3909 and we will be happy to assist you. Since U.S. Seafood & Meat Co. offers nearly all perishable products, shipping ALL our seafood in the freshest condition takes thought and careful planning. We've come up with our own fresh gel pack system that keeps perishables cool in transit for up to 48 hours. We take care to arrange your seafood in specialized boxes designed to keep your order in the freshest possible condition upon arrival. We are dedicated to providing you with the freshest hard shell crabs and seafood on the web; therefore, if you have any questions about our "Return and Refund Policy", please feel free to call us Toll-free at (800) 385-3909. Since the art of crabbing depends on conditions beyond our control, U.S. Seafood & Meat Co. reserves the right to pack an equivalent dollar amount of crabs to fulfill orders.